BRISBANE, Australia—Certain days and events stay in our memories for many reasons, some joyful, others sad, but for Chinese families gathered in Brisbane Square on a rainy July 16, the memories of certain events in their homeland are shocking. They have come to mark the seventeenth anniversary of the brutal persecution of Falun Gong practitioners in mainland China. 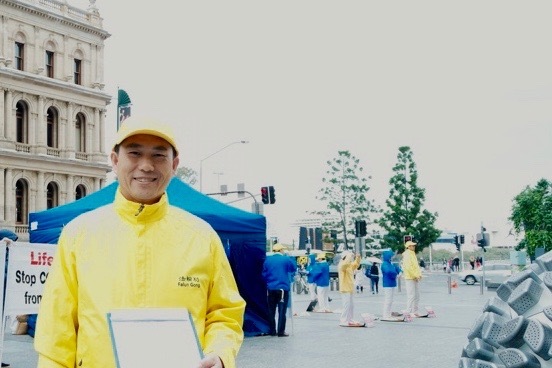 A number of Falun Gong practitioners at the Brisbane event experienced the ongoing persecution in China first hand, their lives changed forever and, forced to flee, now unable to return to their native country. Now she lives in Australia and practises Falun Gong freely, with her husband who also fled China as a result of persecution. On hearing about the ban, he thought he needed to let the government know how good Falun Gong was. “I think the government shouldn’t ban Falun Gong, so I went to the petition department of the government together with other practitioners,” he said. His message was “that all the Falun Dafa practitioners are good” people. For this he lost his freedom for six years. The persecution extended to his other family members, who were also practitioners. In his family, a total of 23 years have since been lost in prisons or labour camps because of the persecution. 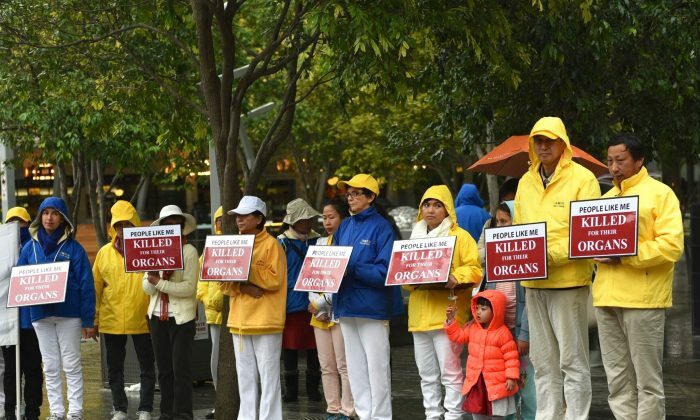 Yu wants more kind people to speak out to stop the ongoing persecution and the horrendous crime of organ harvesting from detained Falun Gong practitioners in China. Xie Weiguo, now a senior research fellow at the University of Queensland, recalls being one of the thousands of people arrested, in 1999, while appealing for Falun Gong at the central state offices. Now he and his family live in Australia and are unable to return to China still: “I cannot go back to China because I was blacklisted,” he said. His father warned him it was not safe for him to return even for a funeral. “I was very sad when my mother died, in 2003, because I cannot go back to China,” Xie explained. He hopes that the former leader Jiang Zemin, who illegally banned Falun Gong, is brought to justice soon. John Meng, a software developer working in Brisbane now, remembers he was travelling in China when the news of a ban on Falun Gong was broadcast in 1999. “Suddenly the media of the whole nation, was pointing their fingers at Falun Gong and tried their best to stigmatise or demonise Falun Gong and I was very shocked,” Meng said. Meng wants the present Chinese leader, Xi Jinping, to bring the former leader, Jiang Zemin, to trial for the deaths of thousands of Chinese Falun Gong practitioners and his crimes against humanity exposed and stopped. Steven Zhang recalls his sister being persecuted in 1999 and suffering greatly, but he knows good will triumph over evil. Zhang collects signatures everyday from kind people to help stop the persecution of Falun Gong. In China, over 209,000 Falun Gong practitioners and Chinese citizens have lodged complaints against Jiang with the regime’s highest legal authorities, according to incomplete data compiled by Minghui, a website that reports on Falun Gong and the persecution in China.